Don't let the small size of the DCV581H deceive you, this vac is capable of handling material of both the wet and dry variety, and traps dust with 99.97% efficiency at 1 micron. In other words, it is HEPA rated. You don't have to worry about keeping track of the attachments you need to clean up the mess, because DeWALT has conveniently provided storage directly on the vacuum. The DCV581H is both corded and cordless, so big messes are no problem and messes with no power nearby are also no problem. It is compatible with DeWALT 20V Max slide batteries as well as the older style DeWALT 18V batteries. Yup, the pretty much thought of it all. 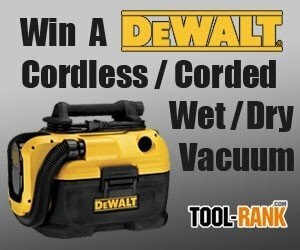 The giveaway is for (1) DeWALT DCV581H Corded/Cordless Wet/Dry Vac.